Discover the wildest imagination through these Translucite artworks. 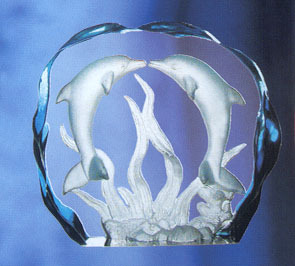 This individual etched Kissing Dolphins TransLucite Sculpture articulates a figurative theme with creative detailed surrounding. The 3-dimensional image seems to float in mid air. It's almost as if these gentle creatures come alive right before your eyes. Light it from any angle, or with a special multi-colored light stand to enhance the beauty and elegance of this attractive art piece. Uniquely handcrafted, each Translucite Collection is an ideal gift, decoration, or ornament. 5 inches H. x 4.5 inches W.